Campus TV is a national student television network rolled out at leading South African universities in February 2019. The new student media solution, including a campus television network, is the brainchild of BOO! Surprising Media Solutions – a leader in the outdoor media industry in South Africa and a digital out-of-home advertising specialist. BOO! Campus TV is powered by a world-class browser-based broadcast system developed in Switzerland, where content and advertising can be controlled and distributed remotely for brand advertisers. At each university, key locations have been identified to place the digital screens – of which the largest is 3.5 metres x 4 metres. The screens will be positioned in areas with high student traffic, such as food courts, dining halls, student centres, libraries and lecture hall entrances. Beyond this, the BOO! student media solution also includes a national, automated campus activations booking system, large format static media, campus radio and alternative media such as student bus branding and direct media drops to student residences (door hanger advertising, for example). The innovative project has been in the works for three years and aims to give tertiary institutions a vital additional ‘third’ income stream, as well as providing brands with direct access to the all-important Generation Z demographic. BOO! CEO and founder, Dave McKenzie, along with his experienced team, has been assisting universities in identifying viable ‘third stream’ income opportunities, like harnessing brand advertising through potential opportunities on campuses. The first universities to sign up with BOO! and which are set to roll out the student media solution are: the University of Cape Town, Stellenbosch University, University of the Witwatersrand, Rhodes University and the University of Johannesburg. BOO! has already begun installation and trials at Wits, Stellenbosch and Rhodes Universities, and will officially launch the new student media network in February 2019, reaching over 150 000 students nationally. Waldi du Toit, BOO! 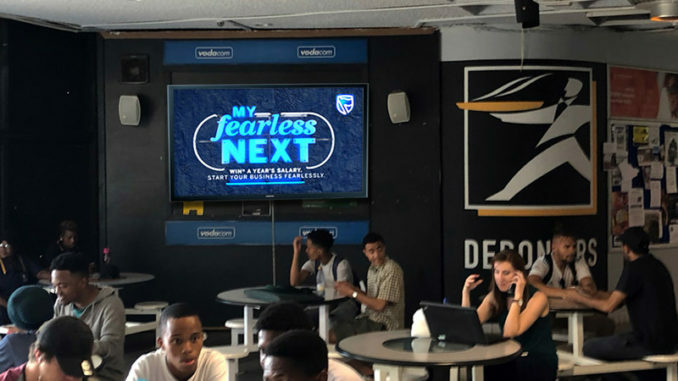 general manager and executive producer of student media, says the company realised – through market research – that the booking, invoicing and management of on-campus activations was also a challenge for brands, particularly with national activations coordinated over multiple universities. Content on the new national campus TV network will include general news and brand advertising, campus news, events and notices, as well as social impact campaigns to benefit and assist students – including opportunities for brands to get involved in social responsibility initiatives. The main aim of BOO! Campus TV is to enable universities to reach their students via an internal communications platform that is positioned in areas of high student traffic, and which attracts students to the medium through local content partnerships that deliver short-form, engaging, youth-related content and up-to-date news, sports and entertainment. “Teams within each university also have access to this software, which allows them to create, manage and distribute their own university content, and even put out immediate emergency notices on their campus,” Du Toit explains. BOO! is actively training content managers at each university to ensure consistency of delivery, and that content remains interesting and relevant at each site. Generation Z – those born in 1995 or later – are variously known as the “iGeneration”, “culture creators”, “the hopeful generation”, “always on” and the “purpose-driven” generation. According to research, they seek uniqueness from the brands they do business with, and they will drive a massive shift in advertising and marketing messages in the coming years, reports Huffingtonpost.com. This is the demographic that BOO! will reach nationwide on campus, creating integrated, unique advertising opportunities for brands.